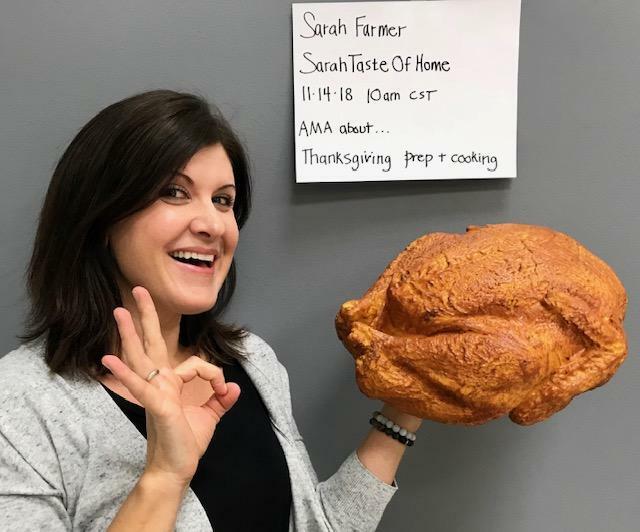 I’m Sarah Farmer, and I’m the culinary director at Taste of Home, where I oversee the test kitchen team and test thousands of recipes. AMA about Thanksgiving prep and cooking! Hi, Redditors! As Taste of Home’s culinary director, I work with food stylists, recipe testers and editors to prepare, taste test and shoot both still photographs and videos of the thousands of recipes submitted by our readers. Each year, Taste of Home receives more than 12,000 original recipes, ideas and tips from our home cook audience, we select and test about 4,000 of them to publish in our magazines and books, and on our website and social media channels. I began my career hiring and advising freelance food stylists—then I became one. And now I oversee a team of talented individuals who make our food stories come to life. I am head over heels in love with what I do: working every day with food and people who love to eat! I am an expert at bringing treasured recipes to life in our professional test kitchen and visual production studio. AMA! Hi Sarah thanks for doing this. Every year I make a roasted mushroom dish for our friendsgiving. Any tips on how to kick a mushroom side dish up a notch? Thanks! This sounds really good! What mushrooms do you use? If you don't already - you could try a mix of chanterels, shittake, oyster, enoki, crimini?? How about adding some fried shallots or shaved garlic slices on top for crunch? You could also sprinkle with seasoned, toasted bread crumbs. Maybe add some dried cranberries for a touch of sweet? And then theres's -- BACON! Or, fried pancetta. Crunch is the key. Good luck! Sliced toasted almonds are awesome with mushrooms of any kind also! What do I do about baking at 3000 ft??? Everything I’ve tried just lands me flat cookies and I’m worried my thanksgiving pies will also suffer this flat fate. Baking at 4200 ft, I've found that things that are supposed to rise do so much more quickly than expected. For bread I can use 1/4th to 1/8th the yeast specified in the recipe, for example, and it still rises faster than the recipe states. Makes sense because there's less air trying to keep my dough down, man. For cookies, try refrigerating your dough for an hour before portioning and baking. A colder dough will help to resist the spread! Thanks! Refrigerating dough is something I try to tell everyone to do. It just makes the cookie so much better! Maybe I’m simply baking them past their rise point....the deflation seems to happen after they come out of the oven. I'm vegetarian and I wonder how to make a plate of veggies more "Thanksgiving-y." Are there certain herbs I could be using? Other ingredients to add? Good question! Sage is a good herb to turn to. Fresh shaved fennel might add a little brightness to a fresh salad! How about fresh or dried cranberries? Pecans -- make sure to toast them first. Toasting really adds depth of flavor. Think seasonal veggies, too. Parsnips, sweet potatoes, squash. I'll bet you come up with something really delicious! How do you shave fennel? Those little kernels are super tiny. I’d shred my finger tips. A mandoline works best to shave fresh fennel, which has a broad, bulbous base that's treated like a veggie. You can pick up an economical and perfectly good mandoline at most Asian markets. I didn't know you still existed! I still make Creamy Vegetable Soup from one of your very first issues! A family favorite when someone is under the weather! Why didn't I know ToH was still a thing? No TasteOfHome subreddit? I'll have to look at your website. I imagine keeping up with the changes in lifestyle and diet ("real" and "imaginary" changes haha, like we'll ever be thin again?) is difficult indeed. Great-grandma never even knew her cholesterol and blood pressure numbers. How do keep current without losing sight of the original mission? Is vegetarianism and ethical eating coming into the picture for ToH too now? Even ol' carnivores like me are eating less meat, and preparing what we do eat more healthily. I am obsessed with sous vide cooking now, for example. Please please bot don't remove my comment because it's not a question because there are definitely questions here!? Yes, please check us out online! We have tons of recipes (shared with us from readers everywhere) that our culinary staff prepares in our test kitchens. Our website has recipe collections, helpful and entertaining articles, cooking videos, tips, etc. TOH absolutely needs to keep up with lifestyle changes in cooking and eating. And since the recipes we publish in print, online and share through our social media channels are YOUR recipes, they do reflect some new things (new ingredients, cooking methods/techniques, appliances, dietary restrictions, etc.) that are becoming more and more popular. We strive to provide our audience with the recipes they've come to know and love from Taste of Home -- recipes that work each and every time, that are easy to prepare (with well-written directions) and use everyday ingredients found at your local grocery store. But we must also provide readers with recipes that they're searching for -- gluten-free, dairy-free, keto, grain bowls, new/different veggies, new flours, new sweeteners, more ethnic cuisine, whole ingredients, vegetarian, lower fat, lower sodium and so on. You'll see that our recipes offer suggestions/tips on how you can make a particular dish lower in fat and calories by substituting (or omitting) certain ingredients. The rise in popularity with electric pressure cookers and air fryers is also something we've tapped into. We've tested and published recipes (and have a few recipe contests running) in both of these categories. Sous vide - not yet but we'll see! I really appreciate your post/questions. And I'm very excited to know that a TOH recipe is one of your family's favorites! You can find Taste of Home magazines and cookbooks in grocery stores and everywhere books are sold! Thank you! Hey Sarah! Do you have a favorite pie crust recipe? I do! I love using butter in my pie crusts so I always do this... https://www.tasteofhome.com/recipes/classic-butter-pie-pastry/?trkid=soc-toh-redditsarah. Some folks prefer the tenderness that you get with shortening. Some folks do a combo of both butter and shortening. I like straight up butter. What pies are you making? Hey There I have a quick question. Ive been working in restaurants as a cook for close to 10 years now in nyc, Ive worked in every type of restaurant from japanese, to thai, to italian, from michelin starred places down to even butcher shops. Ive amassed alot of knowledge and experience but im incredibly burnt out. Ive always thought of working in a test kitchen as an R&D chef or even just a helper or assistant. My question is how would I go about getting my foot in the door to one of these places? Is it possible, do I need to know someone to get me an In, or can I get by with just my resume. If you could help me at all with anything to add or do to stick out from the crowd Id truly appreciate it. Thanks for reading this and for your time. Hi. Wow - sounds like you have a lot of culinary experience! The restaurant industry can be grueling, no doubt. Start by checking out corporate websites of companies that have professional test kitchens or food R&D labs. (Taste of Home, America's Test Kitchen, Meredith Corporation, McDonald's Corp., etc.) Look for a "careers" tab and/or "job openings" to see if they're hiring a prep cook, test cook, recipe tester, recipe developer, culinary assistant, culinary designer, food stylist -something like that. You don't necessarily need to know someone on the inside. You may even want to try looking at established culinary schools to see if they're hiring culinary instructors or support staff (Culinary Institute of America, etc.) Best of luck with your pursuit! I wish you success. hi sarah, i'm planning to order some pre-made food from our grocery store bc we don't have time to cook. if we made 1-2 things at home to make our meal feel a little less like takeout, what would you suggest we focus on? thanks. You are smart to have the grocery store help you out a bit. I have done that in the past, too. I'd suggest preparing a few simple sides. How about Maple-Glazed Green Beans https://www.tasteofhome.com/recipes/maple-glazed-green-beans/?trkid=soc-toh-redditsarah. This is a SUPER easy recipe - Glazed Sweet Potatoes. https://www.tasteofhome.com/recipes/glazed-sweet-potatoes/?trkid=soc-toh-redditsarah. It's easy to multiply it for a larger crowd. Would you consider making a specialty beverage? Something like Apricot-Apple Cider would be tasty! You could add a little bourbon 😊 for a fun kick! https://www.tasteofhome.com/recipes/apricot-apple-cider/?trkid=soc-toh-redditsarah. Besides cranberry sauce, what other sides/preparations might work best to help bring brightness and balance to an otherwise heavy meal like Thanksgiving? What would it take to get a job in an organization such as yours? Would you prefer somebody who has worked in the culinary industry for a long time, or would you prefer somebody who has a food science degree, but is fresh out of culinary school? Hi! It depends on the specific role. Formal culinary education is preferred but not required. Previous culinary experience is a must, however. Portfolios may also be required. Check out our corporate website - click on the Careers tab and view Active Job Listings to see if there's something right for you! What's a good dessert to make during the holiday season? I'm looking for something simple and delicious! Hi Sarah - best way to carve a turkey? Ok so I'm a regular person who loves to cook. Every Thanksgiving I make the normal mashed potatoes, gravy, deviled eggs, turkey, stuffing, biscuits, cranberry sauce, etc., but do you know any normal person cooking level Thanksgiving sides that not many people make? This is something you can do well ahead, months ahead in some cases. Prepare uncommon sorts of pickles like watermelon rind pickles (they're like jewels! my favorite pickle) and many sorts of pickled vegetables, sweet recipes and sour recipes. Then put together a pickle platter with green and black olives as well. Radish roses, scallions. There are so many heavy, rather fatty dishes at a holiday table. Items like sauerkraut or red pickled cabbage, pickled carrots, sweet and spicy/hot pickles and olives are a good flavor foil for turkey, dressing, etc. We always had a pickle tray when I was growing up. I knew Tom Clancy and he's the one who told me about sauerkraut at Thanksgiving, and I tried it and he was right--it works! This is such a fun reply to the question! I love all of your suggestions! I always make the pies, homemade breads (last year I made 4 kinds!) and a few healthier veggie sides. I know not a lot of people get excited about vegetables at Thanksgiving, but I agree with the other reply that they are a good way to add some freshness to the meal, and to bulk up the plate without feeling guilty. I love getting baby carrots with the stems attached and roasting them til mostly soft and tossing in honey or real maple syrup and something spicy like Aleppo pepper. I made a roasted cauliflower dish once that had garlic, capers, sherry vinegar, and olive oil with lots of flaky salt, and people were asking for the recipe. Frozen peas are super easy—try sauteeing a minced shallot and garlic in butter or olive oil, then add the peas and some thinly sliced basil or mint. Classic and so easy and fresh tasting. Sometimes we do spicy garlicky schezuan green beans instead of that awful gloppy casserole. Broccolini tossed in lemon and garlic. Or barely-cooked asparagus with lemon and garlic. There’s always a big green salad with a good homemade vinaigrette and lots of fresh and pickled veggies in it. I find it quite nice to fill up 1/3 of the plate with veggies like these, then do the rest with the turkey/ham/whatever, mashed potatoes, stuffing, etc. Homemade bread - yes! We have a really great Crusty Homemade Bread recipe that is sooooo delicious. Going off of your garlicky schezuan green beans - what about something like roasted Shishito peppers? They're traditionally served in Japanese cuisine roasted and tossed with sesame oil and a dash of soy sauce. That would be something different -and delicious! Mmmm - what about sauteed radishes? Quartered radishes sauteed in a little butter. Very good -seriously! Good luck!!! Why are you holding a dead turkey’s corpse? LOL! Favorite question so far. It's a replica turkey, man! We used it to stand-in for our beauty/"hero" turkey on set -in the photo studio. Replica food is serious business - pricey. Sometimes, we toss it around like a football. Would love to see some of your favorite Thanksgiving sides recipes! Can you share any? I could seriously fill my whole plate with sides and be a happy Thanksgiving camper! I love sides. Here are a few collections of side dish recipes for you. https://www.tasteofhome.com/collection/thanksgiving-casseroles/view-all/?trkid=soc-toh-redditsarah. And here's another collection of favorite Thanksgiving sides. https://www.tasteofhome.com/collection/favorite-thanksgiving-sides/view-all/?trkid=soc-toh-redditsarah. I really love Creamy Mashed Cauliflower -since I'm allergic to potatoes. https://www.tasteofhome.com/recipes/creamy-mashed-cauliflower/?trkid=soc-toh-redditsarah. My family has a recipe only referred to a “green jello” it consists of like jello, crushed pineapple, and cream cheese. It’s meant to be a salad. Is Spatchocking a turkey the way to go? I'm a bit nervous to try it...any advice? What do I do if my turkey is still frozen? D'oh! A frozen turkey?! Hey - no worries. Here's how to defrost a turkey the right way. If you don't have time to thaw it the traditional way - - here's how you can cook it from frozen. What is the most underrated dish for thanksgiving?